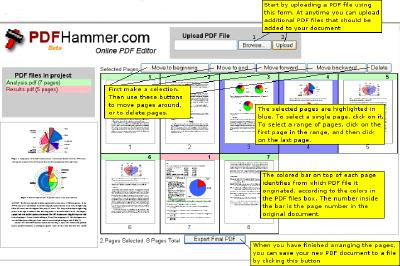 PDF Hammer is a free web utility that allows you to do some basic edits to PDF files online. You can upload an individual file or multiple files and then easily rearrange the pages, delete pages you don't want or even combine files. You can then export your project as a new PDF file. The developers are working on adding functionality to allow you to rotate pages and apply watermarks and stamps to pages. It'll never take the place of a dedicated desktop application for the serious PDF creators out there but for the rest of us, it's an ideal tool and it's free. Clicking on the "start" button brings up an error message. Errno 122. I'm using Mac OSX 10.4.11 and Safari 3 on a Powermac G5. It worked when I tried it a while ago and that was using a iMac G5 on OS X 10.4 (can't remember which version). Looks like touchpdf is only free if you want non-printable PDFs. Still it's a useful service.